Lewis Hamilton has dramatically snatched pole position for his home British Grand Prix with a last-gasp fastest lap after having his provisional pole time deleted by the stewards. Hamilton held the fastest time after the first runs, but the stewards judged him to have exceeded track limits in the process, forcing them to erase his time and leave him with only his final lap to fight for pole. His first time had been three tenths of a second quicker than Nico Rosberg’s, but the Briton was able to almost replicate the lap exactly to re-establish his lead at the chequered flag. 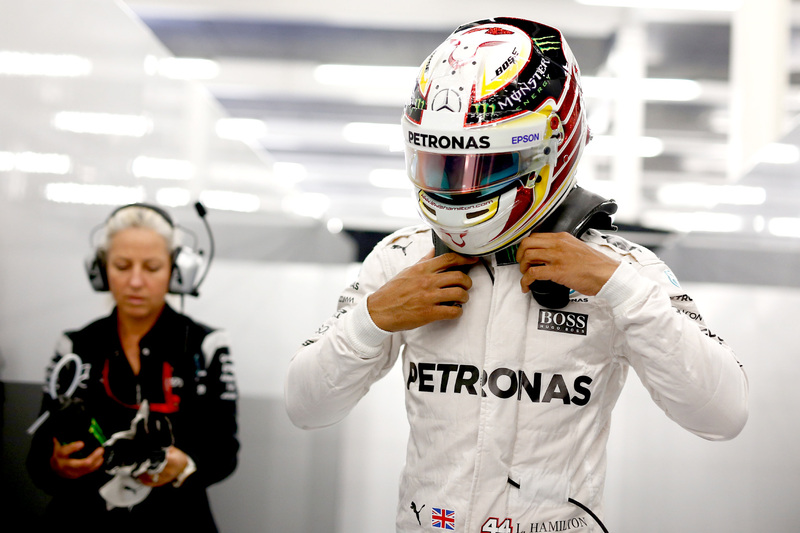 “Not the cleanest qualifying session,” said Hamilton. “[But] I think we had really good pace. “The penultimate lap was a very good lap, but unfortunately it was taken away — I touched the kerb and it just pulled me further; I didn’t feel like I was going to be running wide. “The second lap wasn’t as good, but I was making sure I was cautious in getting that lap in. Hamilton will be racing for his fourth victory at Silverstone and the record of most successful British driver at the British Grand Prix held at this circuit. “Tomorrow, as always, is going to be a very tough race,” he said. “It’s important we do our due diligence tonight and tomorrow morning to understand the strategy and the tyres. Rosberg was unable to deliver a reply to Hamilton’s blistering pace on his final lap, leaving his time unimproved and his car to start from second place in tomorrow’s race. Red Bull Racing confirmed itself as the second-fastest team, but it wasn’t as close as it hoped after practice. Max Verstappen outqualified teammate Daniel Ricciardo for the first time since his round five switch to the team, but he was an entire second off Hamilton’s pole time. “I think in general I’ve been a bit unlucky the last two qualifyings, but in the end the race pace was promising and it all went well,” responded Verstappen to the question of his teammate. “Today was an especially good qualifying, I really enjoyed it. Ricciardo was 0.3 seconds slower than Verstappen at the end of the session, but he held a 0.2-second buffer to Kimi Räikkönen, the fastest Ferrari in fifth. Räikkönen was out of sorts for most of the session, particularly in qualifying two, but nonetheless outqualified teammate Sebastian Vettel, who was a shocking 0.7 seconds slower than the Finn. Compounding Vettel’s woe is a five-place grid penalty for an unscheduled gearbox change — his second in succession — which demotes him to eleventh for Sunday’s race. Valtteri Bottas was seventh fastest, 2.2 seconds off the pace, despite Williams locking out the second row this time last year and temporarily leading the race. Worse for the quintessentially British team was that Felipe Massa couldn’t make it to Q3 at all after he was eliminated in P12. Carlos Sainz qualified eighth ahead of Nico Hülkenberg and Fernando Alonso, but the latter two both had times deleted at the end of the session for exceeding track limits, leaving them with unrepresentative laps. Though Mercedes, Ferrari, and Red Bull Racing were confident of making it through to Q3, Kimi Räikkönen proved a thorn in the Scuderia’s side, wasting his first two attempts — the first with a spin and the second with a lock up — and requiring a third run. The Finn, who re-signed with Ferrari for 2017 this week, managed to set a time good enough for sixth, but the tyre on which he set the time, which will be the set he has to start the race on, were badly worn by the time he crossed the line. Fernando Alonso and Carlos Sainz were the incursions into the top 10 that disrupted Force India and Williams from a clean Q3 qualification. Sergio Perez was the unlucky Force India to miss out, falling short of the top 10 by just 0.2 second, while Felipe Massa qualified behind him in twelfth and a further tenth off the pace. Romain Grosjean led Haas teammate Esteban Gutierrez in thirteenth and fourteenth, while Daniil Kvyat complained that Kevin Magnussen blocked him on his fastest lap, the result being the duo qualified just fifteenth and sixteenth. Track conditions remained cool from the beginning of Q1, prompting every car to use the yellow-striped soft tyre — the softest in Pirelli’s range comprising the soft, medium and hard compounds. With Sauber’s Marcus Ericsson hospitalised as a precaution after his massive free practice three crash, only five drivers were at risk of being eliminated. Sauber, which continues to financially struggle to such a degree that it won’t complete the post-race test on Monday and Tuesday, was too far off the pace to compete, leaving Felipe Nasr in P21 and easily outqualified by the Manor cars, which qualified nineteenth and twentieth with Rio Haryanto leading Pascal Wehrlein. The fight boiled down to between Jenson Button and Renault’s Kevin Magnussen and Jolyon Palmer, the McLaren driver just within the top 16. McLaren was forced to keep Button in his garage after his rear wing detached on his fastest lap, forcing the Briton to watch Magnussen put his Renault above the Briton on the time sheet. Confusion briefly took hold in the McLaren and Renault garages immediately after the session when the stewards debated whether Magnussen had exceeded track limits on his fastest lap, but the decision ultimately fell against McLaren as Q2 began.